Adobe Flash remains at the center of various security concerns reported in the recent months, including yesterday’s Yahoo ad network being hacked through unpatched Flash vulnerabilities. While Apple doesn’t natively support Flash with its Safari browser or its devices, Chrome still comes with Flash enabled. Considering several high security risks that Flash exposes your computers to, it might be a good idea to disable Flash in Chrome on all your devices. This doesn’t mean that you won’t be able to use the websites still utilizing this plugin, including the mass favorite YouTube, as you can tweak the settings to have it run when needed. You will have the choice to disable Flash plugin completely or when the Flash player is allowed to run. Follow these steps to disable Flash in Chrome and get rid of the security vulnerabilities. Check the Let me choose when to plugin content if you want to have the handle of playing Flash videos and other items in your browser. This will also rid you of those annoying video ads based on Flash. You can always choose to play them but they won’t run automatically. OR, you can check the detect and run important plugin content if you don’t want the hassle of playing everything by yourself. This option, when enabled, will help Chrome moderate when it is necessary to run Flash content on a site. Chrome will automatically run that content for you. When you want to view a disabled Flash video or other item on a site, right or control-click it and select Run This Plugin from the context menu. Your selected video will then start playing. 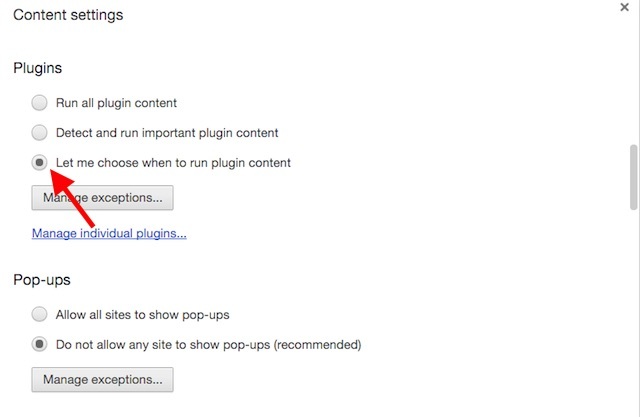 Click on Manage individual plugins… under the same Plugins section of the Content settings windows. Click on Disable to disable Adobe Flash completely. These are a very few and simple steps to help your machine stay safe from the innumerable vulnerabilities that Adobe Flash exposes you to. Not to forget Flash’s resource hogging activities too. Choose the options best suited to your consumption of Flash-based content while still managing your security. The post Tired of Adobe Flash Security Vulnerabilities? Here’s How to Disable Flash in Chrome by Shaikh Rafia appeared first on WCCFtech.